Hello, my name is Cheryl Moya and I am the music teacher and music program coordinator here at Saint Ann School. I have been sharing my musical talents at Saint Ann School for a long time! All students, from preschool to 8th-grade attend my music class once a week and many take part in my after-school clubs "Ringing & Singing" and "Experience Choir Chime Ringing". Our Music Clubs offer an opportunity for students to participate in two ensembles: "Experience Choirchime Ringing" club - open to grades 4, 5 and 6 - This club is open to students who are in good standing with general/vocal music. While attending this club, students will have the opportunity to experience playing the Malmark TM Choir chimes and train for our premiere ensemble "Ringing & Singing". 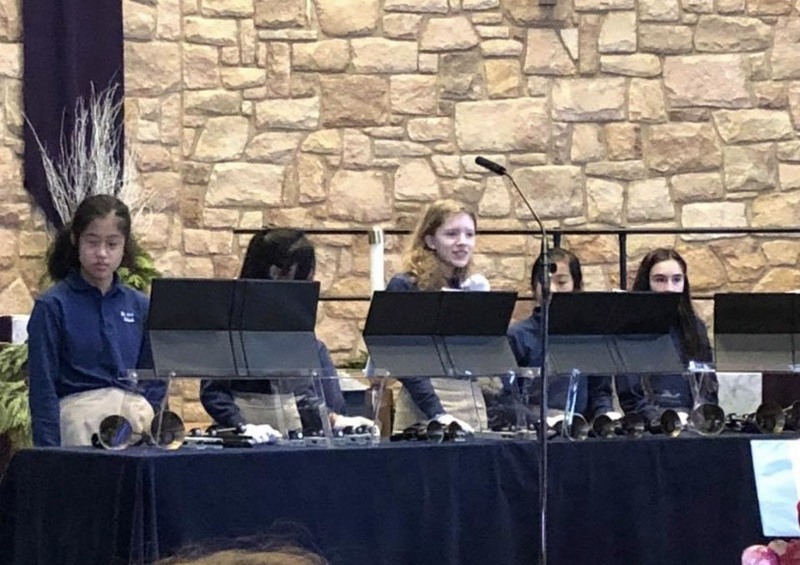 "Ringing & Singing" club - open to grades 5th through 8th - Students participating in this club play from a challenging repertoire of Handbell/ Handchime literature. Vocal training is also included, as the ensemble often self-accompanies choral presentation in group and processions. This club often performs at the opening of our school Open Houses and at the school Christmas Pageant. The clubs are held at the Faith Development Center once a week right after school from September to December, in preparation for the school Christmas Pageant. Each club also meets in the Spring for a 10-week session.